Having made the decision not to risk trailer and car at Gunshot Creek, we had bypassed to the camp at Cockatoo Creek, some 10km north, then drove back hoping to see less conservative people prepared to risk their vehicles. It was quiet when we arrived with only another family there awaiting some action. We walked down to the creek where the Hall of Fame tree lies adorned with wreckage from the cars that didn’t make it, bragging notices and a lot of rubbish. On one side there are three main crossings, No.1, the original path offering a vertical drop some 3-5m into a muddy pool. With only centimetres either side of the car it leaves no margin for error and only the brave or foolhardy attempt this. Ferns grow out of the cliff walls on either side. No.2 and No.3 are not much different, offering only slightly less than vertical entries, with longer deep muddy exits. On the other side some 4 or 5 “chicken” options are available where the car’s entry can be controlled to a certain degree. We ended up seeing two cars do this side before we left, both performing the crossing relatively effortlessly, though the first Patrol lost both taillights on the descent. The secret to an easy crossing appeared to be suspension lift and large mud tyres. Without these a winch is the necessary accessory to get out. It was only later that we discovered we missed out seeing the five cars that completed No.2 later in the afternoon when they turned up at camp in the evening. Just as we approached the West Australian border a wild dingo calmly crossed the freeway in front of us. It was our first on the trip. We pulled over for lunch to eat some residual items that we knew would be lost through quarantine. 25km short of the border the coastline becomes a sloping descent rather than precipitous cliffs. Whilst a dirt road to the beach beckoned we gave it a miss and the kids had fun catching desert cockroaches in the car park. These insects were of herculean stature, buzzing past slowly everywhere. We swatted a couple for closer examination. At the border we decided to play another Nullarbor Links hole to relieve the boredom of long straight roads. The straight par 3 hole looked a doddle, but when the clubs were handed over without balls, “because everyone loses them”, we noticed the fairway was largely rocks and dirt and it wasn’t long before balls were ricocheting into the bush in all directions. Armed with two clubs, one for striking the ball, the other for defence against abundant brown snakes, we zigzagged our way up the fairway several times, as we all wanted a go and we only had two balls. Best score of the day, two over par, 5. 50m away as we crossed the border we had a good chat with the quarantine officers who spoiled the kids with chuppa chups. We surrendered the few remaining items we hadn’t been able to eat then drove through. Here we are in West Australia after almost 15,000km on the clock. Hannah received a timely challenge in Huonville, to spot and photograph a duck-billed platypus. Fortunately we were camped right next to a river with them in so after a couple of hours the challenge was complete. They were pretty skittish creatures, not surfacing for any length of time. For any twitchers out there, there were quite a few birds there too, including the striated pardalote. Heading south from Trial Harbour we didn’t stop long in Strahan and pressed on to Lake St Clair. Parts of the highlands reminded us of the Alpine regions in NSW, though between the forests emerged plains of tussock grass and heaths that were blooming in pink and yellow (gorse). Every road we drive has spectacular spring blooms. The standout on this leg was the deep red waratah that is interspersed in the forests approaching Lake St. Clair. The lake is the deepest in Australia at almost 200m, and with the altitude has very cold waters, a perfect place for Xavier to attempt the class challenge swim in Australia’s coldest waters. After eight, yes, eight Weetbix for breakfast he donned a spring suit and jumped into the icy waters, emerging after the agreed one minute timeframe. Job done he even volunteered to take his brother in for a second time. We thought the campground was a bit pricey for what it offered and when each shower costs a dollar on top of that you’d expect they would be prepared to change money, but it was only done reluctantly. Time to move on to better places. Disappointed with our lack of Tassie Devil sightings at Arthur River we headed south towards Strahan, deciding on advice from the rangers to stop at Trial Harbour. This quaint little village used to be a tin mining village but even now has a scattering of houses and shacks behind the dunes. The history room has a fascinating collection of minerals, animal bones, bottles and memorabilia from the mining days. Well worth a visit for a donation to the flying doctor service. Once again we found Tassie Devil footprints on the beach! Back at the campsite we tucked into chicken fajitas followed by marshmallows cooked on the campfire. The kids went to bed, while we sat and watched the stars and listened to the ocean. When Amanda went to bed she let out a shriek as a Tasmanian Devil was at the trailer tucking into the rubbish. In a mad flurry, this Devil was going to disappear quickly we tried to rouse the kids, get cameras and stop him taking the rubbish away. All I could muster was a couple of shots from the phone camera and Hannah and Oscar blearily appeared to glimpse him lope off. Success at last! Earlier on this week in Tasmania we saw little penguins. Tasmania has been my favourite state so far because it has lots of wildlife. I haven’t seen a Tassie Devil yet but I have found footprints. Dad thinks he saw a feral cat. I got really surprised at the number of English animals that live here e.g. hedgehogs, blackbirds, sparrows, starlings. We have only seen squashed hedgehogs so far. I have been enjoying all the lovely fires each evening because it is a bit colder down here and very windy. The sand is different here because the sand grains are bigger and the waves have been really rough on the west coast. They can get to 20m high in storms. I have found many crabs in the seaweed with algae on their shells. Most of the places we have visited have crystal clear seawater. I found loads of bones from animals like ringtail possums jawbones, pademelon hip bones and lots of other small bones. Our first stop at Boat Harbour was a relatively short drive west from the port of Devonport. Our camp couldn’t have been closer to the sea! 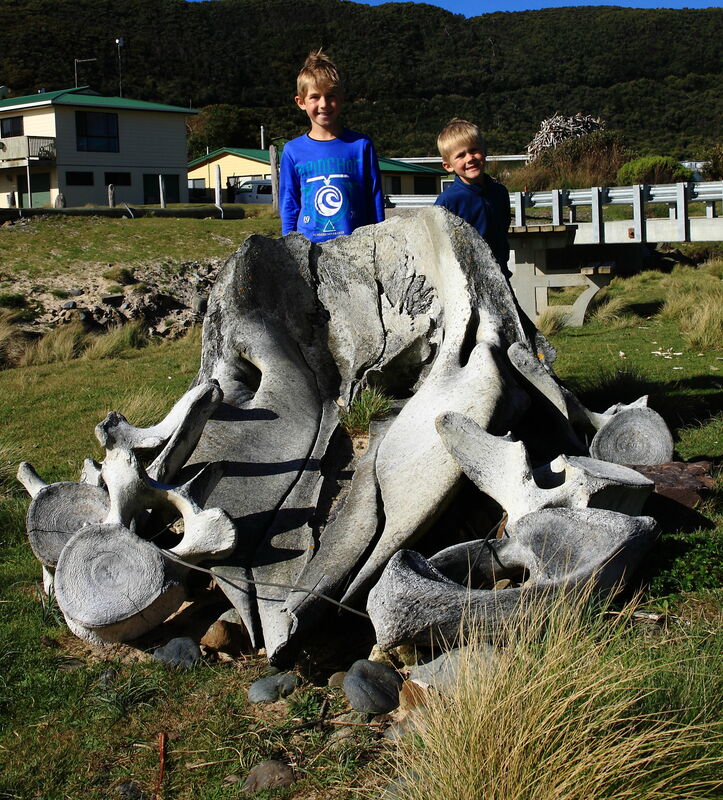 We are all loving the NW coast of Tasmania, the kids are keen fossickers, scouring every shoreline for treasures. Our second day there saw Fifty Toes take on the challenge of the Stanley Nut, a large volcanic lava plug that dominates the port of Stanley. A very steep walk, rather than chairlift saw us at the top in 10 mins. Different lookouts grant you a mutton bird’s view of the town below, where filming was just about to commence for a movie called “The Light Between Oceans” based on the book. We found our first Pademelons (tiny wallabies) in a little forest up there, dozens of them squatting below the bracken. We explored the harbour, then headed inland to explore some of the roads less travelled on the edge of the Tarkine forest. These ancient forests are full of giant trees, tree ferns lining the roads, and the humidity allows a fecundity of mosses and ferns to cover dead and living trees. The kids loved the first river crossing! On the way back we did another detour to see Little Dip Falls and the Big Tree (it was big and impressive). The evening treat was another drive east to Burnie, on a tip-off from or neighbours, to see the penguins coming in to feed their chicks. What a great end to the day to see the little blue penguins hopping out of the ocean and up to the chicks who were sitting in their nests only metres from us, and in some cases below the boardwalk we were standing on. Our good friends Pete and Zoe set us the challenge to go to the four compass point extremities of the mainland. South Point is the most southerly. From the Telegraph Saddle car park it is a tough 16km walk to the Roaring Meg campsite then another 3.7km to South Point from there. The kids carried their sleeping bags and 3kg of water in their packs and off we went. The first few kilometres flew by (it was mostly downhill), but as we started climbing the hill approaching Halfway Hut little (and big) legs started slowing in the heat of a beautiful day. A brief stop at Halfway hut before continuing the climb. The last few km through heathland and down into the forest at Roaring Meg were a pleasure, though a few too many snakes were spotted for my liking (nearly trod on one myself). We set up camp at Roaring Meg, dropped the packs and continued the descent to South Point. There we were welcomed by a calm crystal cobalt blue ocean, the waves lapping gently up the rocks. Hannah got to pose with her favourite dog (toy one) who was smuggled into the park and my pack. After an hour or so there we trudged back to camp completing almost 24km in a day, with barely a complaint from the kids. Despite mild conditions there was a distinct wintery atmosphere inside one of the tents in the morning as my goosedown sleeping bag continued its fatal rupture. One sneeze (and there were many) unleashed a snowdome effect. The return trip was slower and sore but the kids made it with flying colours and much enticement with muesli bars and the promise of treats at the end. We think that was the hardest of the 4 compass points and 40km in two days for kids aged 6,7, and 9 was pretty impressive. Hannah and Dog at South Point! It turned out to be a bit of a challenge but our 6 and 7 year olds lead the way to the top. A 3-4 hour round trip involves a steep climb from the car park, a flat stretch through thick scrub, then a second climb to the base of the mountain top. This is then negotiated via metal steps and ladders to the peak which reveals a fantastic view. A challenging climb rewarded by the spectacular views from the top, especially of the Castle, a flat plateau in the Budawang National Park.